If you follow my writing here or elsewhere, you know that Sunedison is one of my favorite stocks to follow. The reality is that the company has an incredible product, and given recent changes to overall views with regard to energy, I believe that the stock is going to climb. However, if you look at the SUNE stock chart over the past month, growth seems to be far out of reach. Nonetheless, the downtrends are based in sentiment, not fundamentals, and as a result, I remain bullish on SUNE. Today, we’ll talk about why I believe that fundamental data proves that SUNE will rise soon, what we’re seeing from the stock currently, and the incredible opportunity that this is creating for investors that have the testicular fortitude to get involved in the stock. Breaking Down Asset Value – Debt is the number one issue that SUNE faces, and it’s a real concern for many. However, for me, the amount of debt the company has isn’t a concern at all. In fact, the debt is warranted. When a company becomes anywhere near upside down with regard to debt, that becomes a concern for me. However, Sunedison is far from this point. Just look at the value of its current assets. If the company decided today that it was going to sell 100% of its assets and close its doors, investors would be in a great position. In fact, if this were to happen, SUNE would be able to pay off all of its debts with tons of money left over. In fact, even after paying its debts off, SUNE would have more than $4.5 billion left over. That works out to well over $14 per share. Considering that fact, a stock price under $3 per share seems like a bargain to me! Views Toward Energy – On top of the fact that assets far outweigh debt, there’s another reason to be bullish on Sunedison. The bottom line is that the world’s views with regard to how energy is created are changing. Global warming has been proven to be a very real problem, and this is caused by reliance on fossil fuels. In fact, in December of 2015, Paris reached a landmark climate change deal under which 195 countries agreed to reduce greenhouse gas emissions. The only way to do so is to reduce reliance on fossil fuels. This combined with the fact that the Federal tax credit of 30% for consumers and businesses that install renewable energy systems is being extended will greatly increase demand for renewable energy systems like the systems sold by SUNE. The fact of the matter is that Sunedison is a great company, and the fundamental data suggests that the company’s stock is likely to climb in a big way. Some of the world’s most successful investors have said that the best time to get greedy is when fear is high. In doing so, investors have the ability to snap up great stocks at incredibly low values. That’s exactly the opportunity that SUNE is presenting at the moment. So, don’t follow my lead, follow the lead of billionaires! It’s time to buy SUNE! Where do you think SUNE is headed moving forward and why? Let us know your opinion in the comments below! 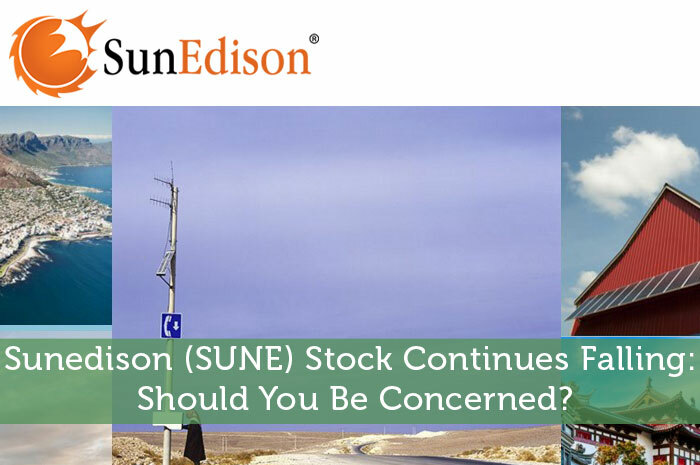 Sunedison (SUNE) Stock Continues Falling: Should You Be Concerned?